At least 576 species of bird have been recorded in the Gambia, none of which are endemic. The Gambia River runs through the country, which is completely surrounded by Senegal. 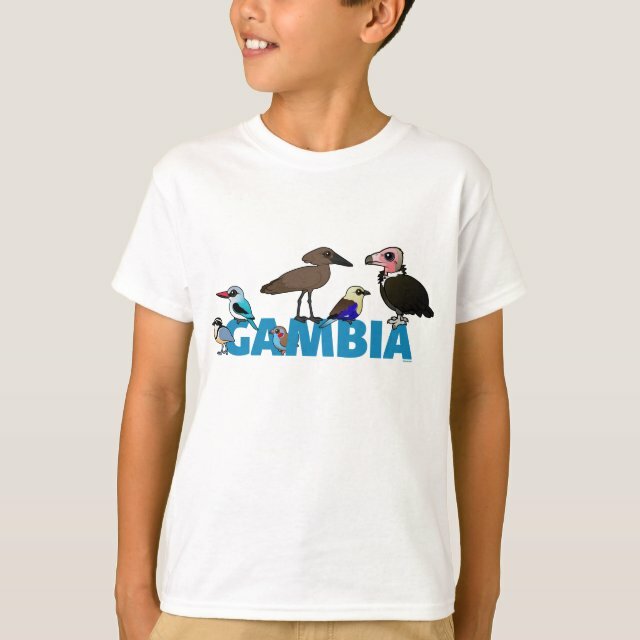 This fun Gambia design features six target bird species that people like to see when they visit this amazing little African country. This design features our cute cartoon version of these six special Gambian birds along with the country name in bold blue text. The birds are: Egyptian Plover; Woodland Kingfisher; Red-cheeked Cordonbleu; Hamerkop; Blue-bellied Roller; and Hooded Vulture. You can customize this gift! Move the design around, change the product background color or product style, or even the product type! Make it your own!